Go into the PUP, open the access way to the water heater and look for the bypass valve. Turn it to bypass the heater. 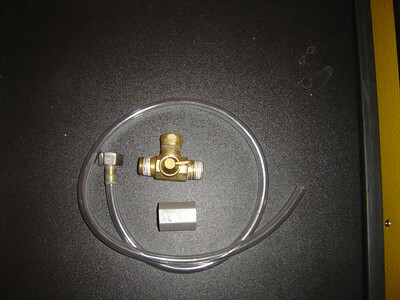 You can purchase or make a bypass kit if needed. 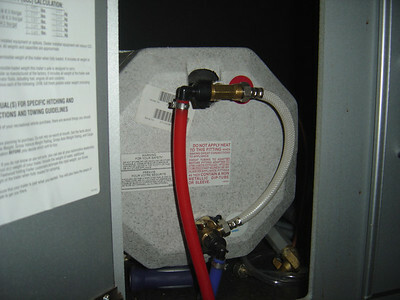 Note the bypass line eliminates filling up an empty heater with Anti-freeze. The simplest method to get anti-freeze into the PUP is to add it to the water tank. 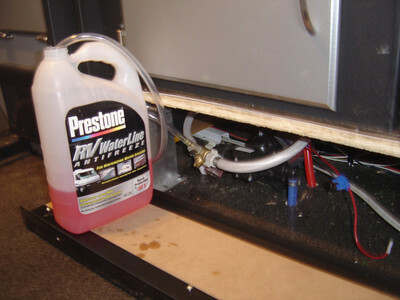 However you either have compensate for the residual water dilution OR if the tank was drained, then you have to add extra anti-freeze to get it up to water pump inlet hose. 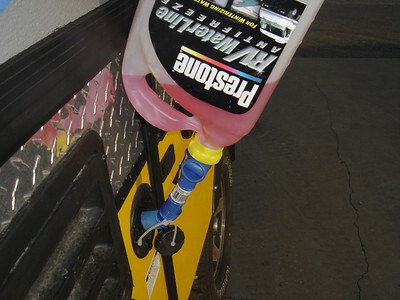 While it is the smplest method, it is not preferred because of the large volume of antifreeze that is needed plus it has to drained or flushed up next spring. 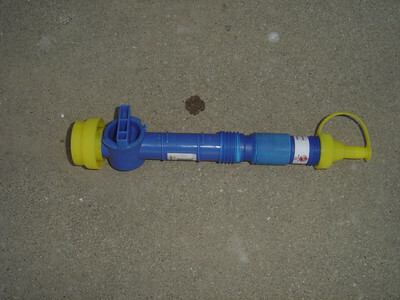 This is a spout and flexible tube that can be used to add anti-freeze to the fresh water tank. 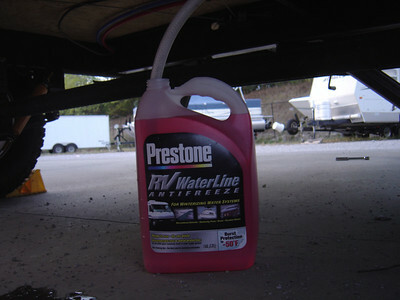 Another way to get Anti-freeze into the water lines is to install a permanent winterizing connection kit. Turn the valve so the pump will pump anti-freeze from the bottle. 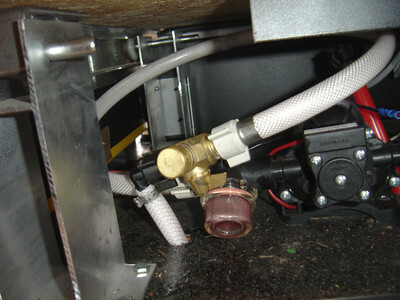 Note - because of a short space between the inlet line and the pump, I had to add an extra hose from a pump silencing kit. 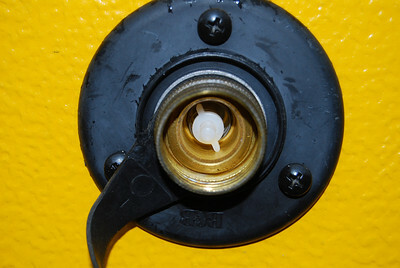 The winterizing connection is placed between the water line from the tank and the pump inlet. The plastic hose from the "T" is inserted into a bottle of anti-freeze. After anti-freeze has been added to the PUP, remove the plastic line and replaced it with a cap. 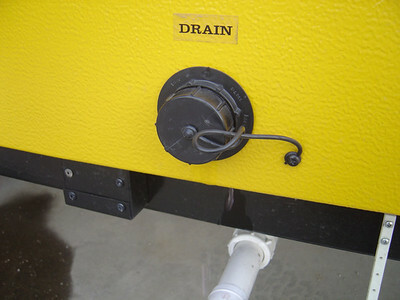 Turn the valve to connect the pump with the fresh water tank. 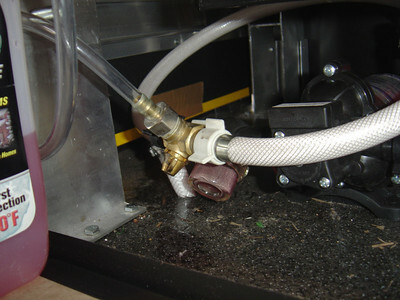 The third way to add Anti-freeze is to use the pump inlet line. This is the 1/2" diameter, translucent, water line at the bottom of the fresh water holding tank. It runs up to the 12 volt pump. Remove the water line by loosening the clamp or hose clip. Insert the water line into a bottle of anti-freeze. Note - you will need two or three bottes of Anti-freeze when you are using the method - the amount you use will depend on the lenght of hoses, number of systems drains, whether you blew out the water with air. 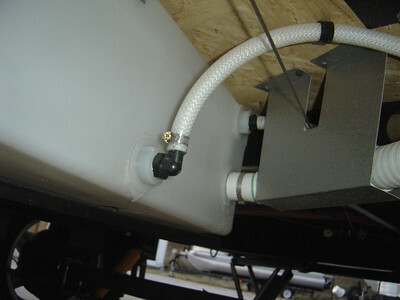 An alternative is to permanetly attached the winterizing kit to the outlet from the tank. To get antifreeze into the system, screw the plastic tube to the three way valve and insert the other end into a bottle of antifreeze. 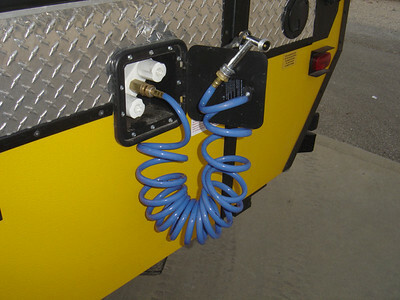 After antifreeze has been added re-connect the pump inlet line to the tank. Note - some folks will connect the air compressor and blow out the Anti-freeze out of the lines (See "Using compressed air to blow out the lines" gallery. This will reduce the anti-freeze taste in the spring. 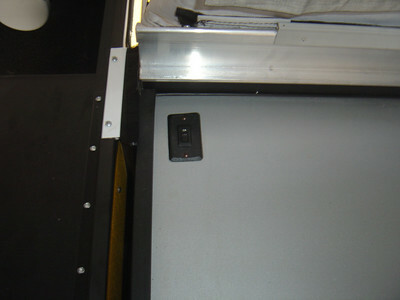 Which ever method you use the next step is to L\locate your pump switch and turn on the pump. 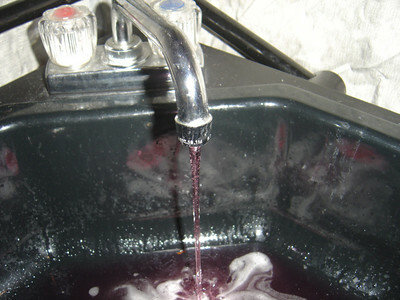 Start with the sink and turn on the hot water faucet until it runs completely pink. Note - a blown out system will not have any diluted anti-freeze. Do the same for the cold water. Let it run so the anti-freeze goes into the drain. Repeat the same procedure for the shower. By now, you may be ready for the 2nd one gallon jug or you may be into the 2nd one gallon jug already. If needed you can slightly open the drain caps and ensure anti-freeze is in the drain lines. Finally, open both the hot and cold water faucets on the outside hose and fill the lines with Anti-freeze. The Anti-freeze should be pumped into a bucket and disposed of appropriately. After this is complete go back inside the PUP and turn off the pump. If you did not blow out the lines you need to ensure that antifreeze is in the section between the city water input and the pump. 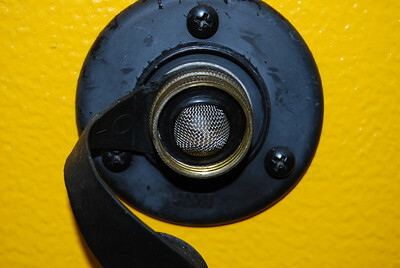 Remove the strainer that is inside the connector. Push down on the plastic stem that is part of the one way valve. Be carefull not to stand right in front of the connector as it might spray out water or antifreeze.